Use on vinylized canvas, chairs, cushions and foul weather gear. Cleans All Vinyl Surfaces, including: Vinyl Tops and Interiors, Vinyl Fabrics, Vinyl Furniture & Upholstery, Vinyl Clothing, Shoes, Laminated Vinyl Appliances and also Cleans Mica Surfaces. -Quickly removes dirt, stains and grease. -Use on vinyl-coated canvas, chairs, cushions and foul weather gear. -Gets out deeply embedded grime. -Excellent for all interior and exterior vinyl. Mix one part Star brite Vinyl Cleaner/Shampoo Concentrate with ten parts water (white vinyl may require a stronger solution) in a bucket. For lightly soiled vinyl, apply solution with clean cloth or sponge and rub the surface. Rinse or wipe off with clean, damp cloth before solution dries. For deeply embedded grime, saturate a stiff nylon brush with solution and apply to vinyl by scrubbing. Work in small areas to keep solution moist. Rinse or wipe treated area with a clean, damp cloth before soiled solution dries. Continue cleaning until entire area to be treated is clean. 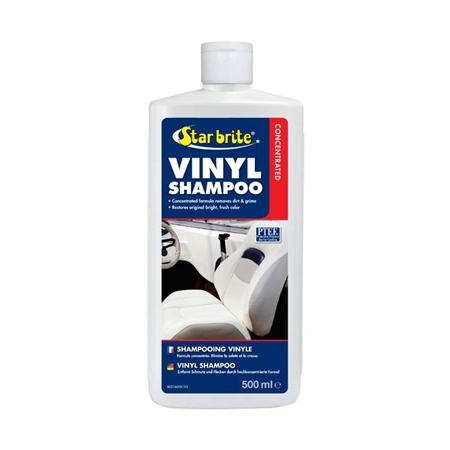 Allow to dry and then apply Star brite Vinyl Brite to protect and preserve vinyl. Do not spill on painted surfaces. Avoid freezing.